Fire and fire only! The simplest expression of the hearth kept in the background of architecture and fire itself. The fire in all its glory and essence. Yet the technology has not taken a back seat: Stûv stoves master the fire and release its energy. The ideal solution for people carrying out building (or renovation) work and prefer to have a stove integrated into the architecture. The stove’s subtle and timeless design prevents it from clashing with the style of decor. Changing mode only takes a few seconds: all you have to do is turn your Stûv 30’s drum until the door you want is in front of the stove opening. The glass door gives a magnificent view of the flames, guaranteeing safety, eco-friendliness and savings, thanks to its excellent output. 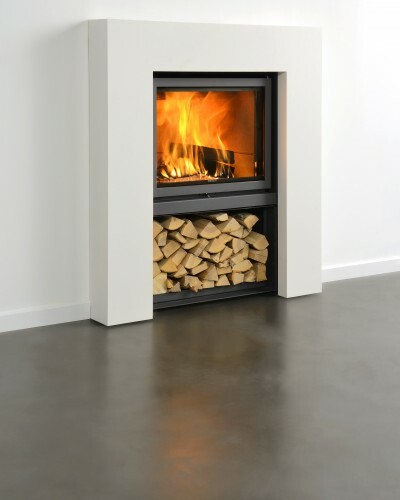 The solid door slows down the fire and optimises performance. Open fire mode means that you can make the most of the crackling flames, the smell of the wood… and even a barbecue! The third generation of Stûv 30 stoves offers optimum combustion combined with a wide range of use (from 6 to 12kW).